When your turn begins, gain 1credit for every 5credit in the Corp's credit pool. 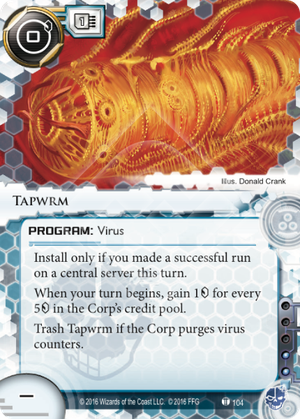 If you are playing Daily Casts in your Criminal Deck right now, consider giving Tapwrm a try instead. Tapwrm can earn you much more in credits than Daily Casts, and it puts pressure on the Corp to either keep its credit count low or spend time purging. It also has a lower up-front cost than Daily Casts. This card is most effective when you are not running lots of other virus cards. When the Corp's decision about purging is just to eliminate this card, it becomes much more difficult to justify. Anyway, Tapwrm is a worth entry into their ranks. The cost is cheap, and the install criteria is pretty minimal. (You can even install it off of archives!) It has some nice bounce-back effects - if the corp is super rich, this thing will pay serious dividends. It has counterplay, since it's a virus. And it rides that wonderful line where the corp has to continuously ask themselves "Should I purge? Is it really worth skipping a whole turn to stop them from getting 2? Maybe I should do it later?" This card isn't powerful to be the focus of any decks by itself. But it's pretty good drip economy, that scales when you're behind, and it's cheap. I expect we'll see this start to show up in criminal decks - runner drip economy tends to be expensive, so anything with the potential to pay for itself on the first turn is noteworthy.